I am so proud to announce that the broadside of "Sage" is now available for sale through Turtle Island Press. You can see a larger version of the print on their site by clicking on the image to the left. The broadside, an 11"x 14" limited edition digitally printed with letter press type, is the first fruit of my creative collaboration with artist Claire Owen. Two summers ago, I was in a writing workshop and met Claire, a book artist whose work I had admired. Being a poet has made me bolder than I used to be, so after the class was over, I emailed Claire and went out to her studio which is a mini-museum of paintings, hand-bound books, and natural artifacts tucked into a Victorian home in Mt Airy. This chance meeting has turned into full-grown collaboration. 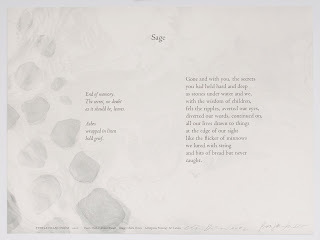 We are hard at work on our artist book combining my poems and Claire's images, including this poem and 20 others. 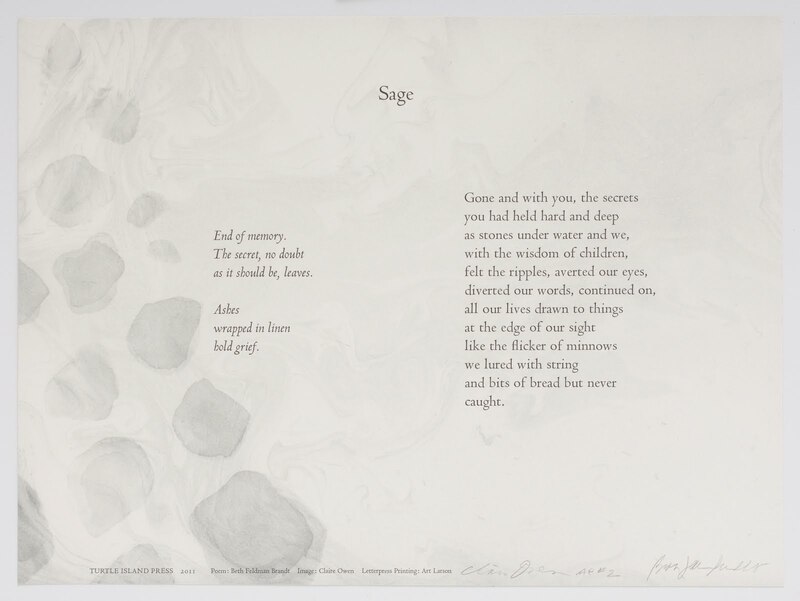 In the meantime, Claire has created a subtle interpretation of Sage in this elegant print. The print is in a signed and numbered edition of 30 of which about 20 are still for sale. Prints are $75 and can be purchased by emailing me here. Purchase can include hand delivery by the poet if you live in Philly! Considering I usually spend my creative time alone with a blank notebook, collaboration is totally energizing! Take a look and post up your comments below to let me know what you think.